Baseball is the hurrah game of the republic! That's beautiful: the hurrah game! Well - it's our game: that's a chief fact in connection with it: America's game. I belong to the Church of Baseball. I'm not as zealous as Annie Savoy in Bull Durham; more of a enthusiastic supporter as much as time and finances will allow. 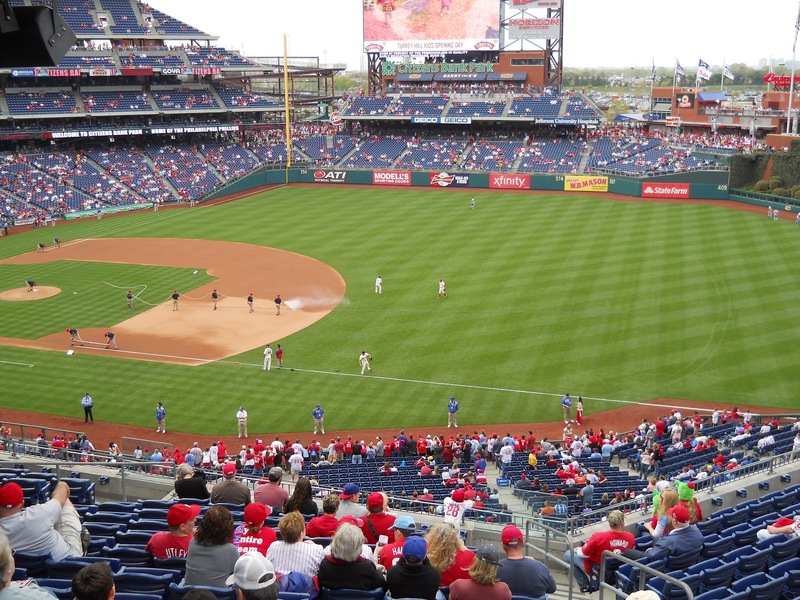 Delaware has no MLB team of its own, so we "borrow" the neighbors' - Phillies or Orioles. The Phillies have been on my altar since childhood. They were one of the few things besides DNA that my father and I had in common, until he converted to the Braves in later years, accentuating an already established chasm between us. There were seasons when I would be glued to every game, and others where I was distracted by the usual life stuff that presented itself. Whenever I returned to baseball, it was always for the Phillies, a big city team with a loony, green mascot, and fans that made Attila the Hun's army look like pussycats. My attention would ebb and fluctuate, even after their 2008 World Series win, until the 2010's Snowmaggedon. In the midst of storms and snowpiles that seemed never to end, I dreamt of spring and all that came with it, including sun, gardens, and baseball. I had never paid so much attention to Spring Training before, but while buried in drifts of frozen white, I became obsessed. Baseball represented everything that winter was not. It was green. It was warm. It was joyous outside playtime. And I began to appreciate it in a way I never had before. Football never held any glamour for me, and seemed a cold, violent sport. So, at the end of each season, I now begin the countdown to the days when our boys travel to Clearwater, Florida to begin their preparations. 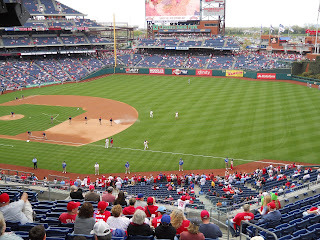 On Art and Baseball Day, after a luxurious dip in the Philadelphia Museum's collection, I drove down to the sociological ecosystem with the dismal name of Citizens' Bank Park. That's what it will be called until the next corporate takeover. If only we could go back to naming sports complexes in honor of dead people who don't try to buy out one another. Having not been to a pro game in many years, I discovered two things. One, not surprisingly, the food is overpriced garbage and you eat it anyway. Fortunately for me, they had vegetarian-friendly overpriced garbage in the form of vegan hot dogs. Two, I could not stay seated. Normally, I watch a game while pumping away on my elliptical, burning extra calories after home runs. I felt claustrophic and fidgety in the stands. Although, I carry around a few unwanted pounds, I'm not nearly as hefty as some other spectators who easily had a least 100 pounds on me and still sat squished in the little plastic seats. It was much more relaxing to walk around, partaking of the occasional fat-laden munchie, and watching the game from the rails. They lost fabulously. Went down in flames. Got smacked home to Mama. It was well enough into the season to not be too surprised. This year so far, the Phillies are inspiring more tears than cheers. Those seasons happen every so often. But, being in a baseball park, I learned, is not strictly about the team. It's a social occasion, filled with mingling, eating, and enjoying fresh air. While observing the crowds, I was reminded of a painting I had stood in front of earlier that afternoon: Toulouse-Lautrec's At The Moulin Rouge: The Dance. Like the baseball fans who milled around the stands and alleys, the painting's subjects were also people from all walks of life gathered at a popular social watering hole. This was our Moulin Rouge, I thought, standing patiently in the ice cream line, while waves of bodies traveled back and forth like blood cells coursing through an artery. At night, the similarity would be even more apparent, under the glow of artificial light. Even though at the ballpark there are kids instead of prostitutes, Henri might still have enjoyed it. I'll be returning later in the season, whether the team finds their game or not, to observe, enjoy, eat like a pig, yell "Hit something!" and absorb the last vestiges of Summer before the cold starts creeping in again.